Click the button below to add the GWYNIAN ROPES BRACELET CLASS (class fee; kit purchased separately) to your wish list. The GWYNIAN ROPES BRACELET contrasts and balances order and chaos, regimentation and freedom, flatness and dimensionality, tight arrangement and playful disorder. I was inspired by the fantasy world's arrangement of gods with opposing forces. Those serving these gods were called the priests of Gwynneth. They teach how to recognize and manage the duality and oppositon of chaos and order. 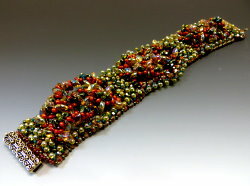 The GWYNIAN ROPES BRACELET is made from either Austrian Crystal or Czech fire polish glass beads, and additional Austrian crystal, Japanese drop, peanut, long magatama, and seed beads, as well as Czech superduo two-holed beads. 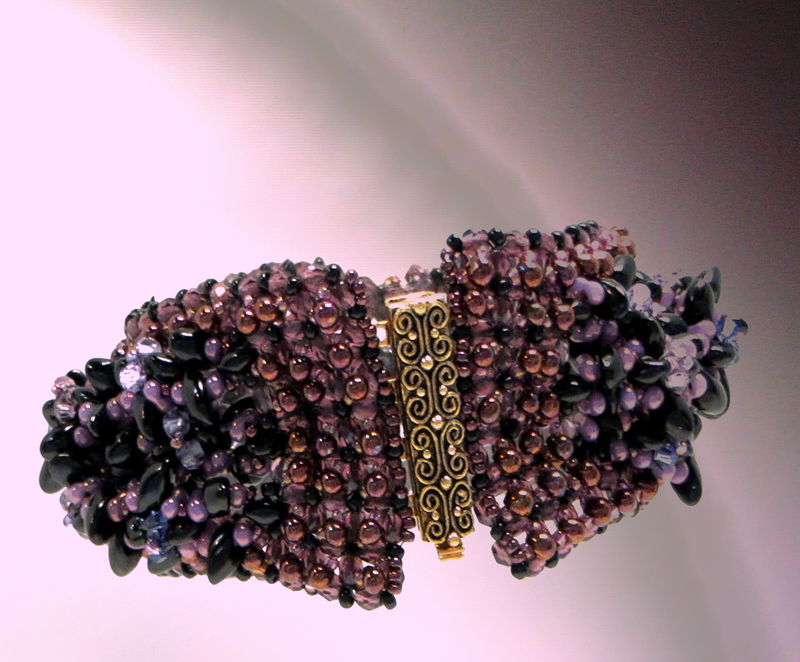 This bead woven piece has a modified right-angle weave stitched foundation of Austrian crystal beads. Dimensionality: We don’t want our pieces to be flat and one-dimensional, nor do we want our efforts to achieve a greater dimensionality to overwhelm the piece. Interplanar Space: We want to build in subtle violations of “straight lines” and “flat planes”, without detracting from the overall aesthetic. Control over interplay of light and shadow: We want the components of the piece, as well as the piece as a whole, to always excite with unexpected reflections and refractions of light and shadow. The piece should never feel like a static photograph. Infuse an intellectual tension: We want this piece in particular to show a successful control over that which is “chaotic” and that which is “orderly”. Some beginner level experience with Right Angle Weave. To utilize many different shapes of seed beads to achieve a dimensional vintage-looking piece with contemporary design elements. 1. Learn variations on right angle weave to create both flat, planar elements, as well as dimensional rope elements. 5. 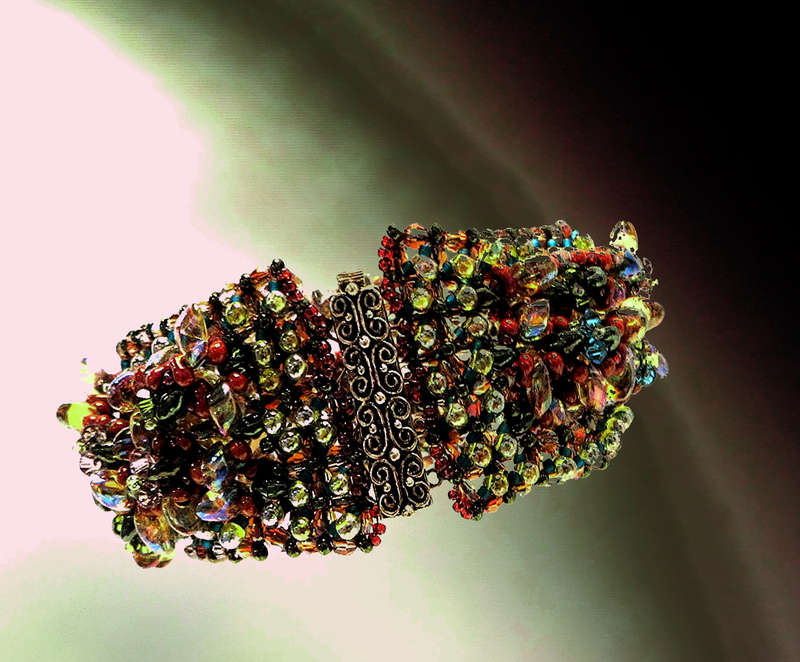 Advocating for Jewelry as "Art" and as "Design"